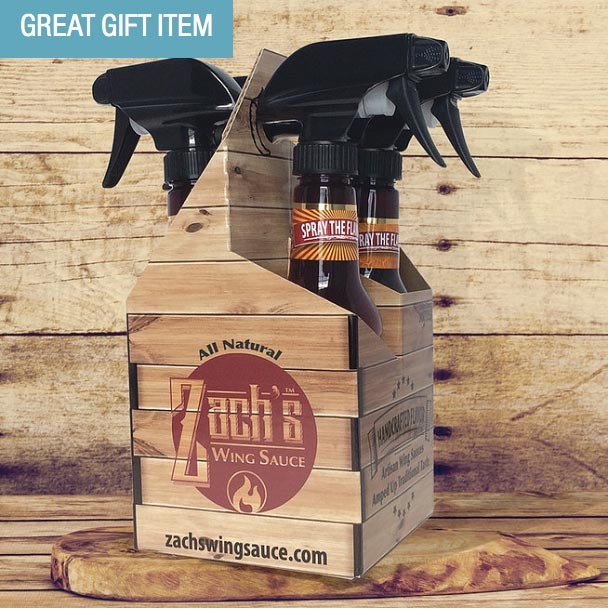 We’re massive wing fans and we all have a bit of an obsession with grilling, so we felt it might be a natural fit to combine those two passions. Making wings takes time and commitment, and with busy schedules, our wing fanaticism is usually relegated to special occasions. We felt it was time to break with the time-honored traditions of cooking those beloved morsels of goodness and improve upon the process. Our aim was to create something convenient and full of flavor that would allow one of our favorite foods back into our respective cooking routines. Zach’s Wing Sauce was the end result. We’ve created sprayable wing sauces based on traditional flavors that we’ve amped up with our own twists. We treat the creation of sauces like craft beer and make them in small batches from premium, natural ingredients. We’re also foodies deep down and the ingredients, coupled with the fact that we grill, pushes for the healthier side of something that is traditionally considered a snack food. We’re trying to generate some awareness of our product, especially as a great gift idea for Father’s Day.